Watching Abul Hasan nudge it onto the leg side and run for dear life was a special moment. This is why we watch cricket! You live in the same world as Abul Hasan. That's comforting to know. 114 - Abul Hasan is the 1st Bangladesh player to make a Test century on debut since Mohammad Ashraful (114 v Sri Lanka) in Sep 2001. Stroke. He is scared of his own bowling. He is trying to delay that event. Hopefully people now give more time to our youngsters to settle in to international cricket. Not only for Abul, but the youngsters that will come in. It's not easy to jump straight in to international cricket. And he only played in T20I's which is a batsman's game. Give these guys a run and see if we can see sustained improvement from them in a period of time. If they don't improve over a course of time, then and only then we should discard them. The name is Hasan, Abul hasan. From now on name "Abul" should be used as the highest honour for individual Bangladeshi batting achievement. 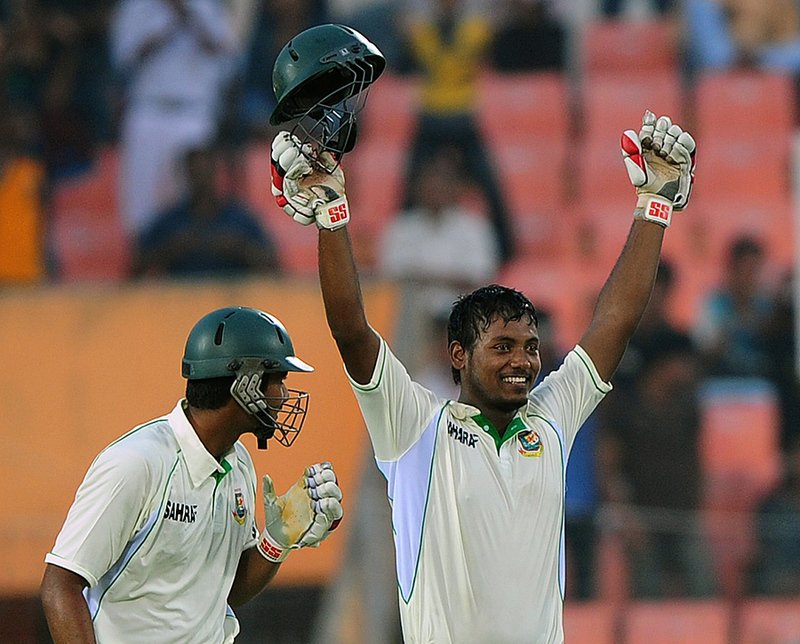 Abul Hasan's unbeaten 100 is the second Test century by a No.10 batsman on debut. The previous such effort was in 1902, by Australia's Reggie Duff, who was actually a frontline batsman who was held back due to a sticky wicket at the MCG. Abul's knock makes him the fourth No.10 batsman to score a century - the last such performance came from South Africa's Pat Symcox. Bangladesh's previous-highest at this position was Tapash Baisya's 66 against New Zealand in 2004. Abul is also the third player from Bangladesh to score a Test hundred on debut, after Aminul Islam and Mohammad Ashraful. The unbeaten 172-run stand between Abul and Mahmudullah is the fourth-highest for the ninth wicket in all Tests, and 23 away from equalling the record. Bangladesh's previous-highest for the ninth wicket was 77. Since the fall of their fifth wicket at 98, Bangladesh have added 267 runs, which is their highest for the last five wickets in an innings. Guys don't call him Abul anymore. He doesn't like it. Because today, he has graduated from Abul to Don. Now I hope and pray that it doesn't remain as just one of those fluke innings.. He has some solid techniques and he should keep improving that BUT not at the cost of his bowling.. he shouldn't forget his first job is to give us wickets and the runs he will score will always be a bonus. How hard is it going to be for him match that show when he bowls? I mean even a 5For won't match that lol. Abul and Shohag have proved that there are lots of talented players in our pipeline . Bring Anamul , Mominul immediately to replace Nazim and SN . ^ What does it say in brackets. Anyways, whoever taught him to bat needs to be our batting coach, legit. Just saw the highlights, mighty impressive stroke play and shot selection. His innings did not have mindless slogging. Abul Hasan shot to fame when he became the first No.10 to score a century on Test debut, in 110 years. He achieved the feat against West Indies in Khulna in November 2012, even before he took the new ball - his primary role in the Bangladesh team. Born in Kulaura, a small town in Sylhet, Abul came through the age-group system where he first played as a batsman in the Under-15 team. After a good spell of bowling, the former Bangladesh captain Minhazul Abedin convinced him to take up fast bowling seriously. A few years later, he took 34 wickets in 11 Dhaka Premier League one-day matches and regularly played in the Academy and Bangladesh A teams. He had to bide his team but earned his first call-up when he was included in the Bangladesh squad for the tour to Ireland in mid-2012 before being picked in the World Twenty20 squad. He became the 65th Test cricketer to play for Bangladesh. Last edited by MohammedC; November 22, 2012 at 03:31 AM..
from the little i saw of his batting he looked a decent bat but his job in the team is to bowl so i hope he can come through with his bowling as much as he did with his batting, truly impressive beginning to his test career though. otherwise how oil did he bowl today? I couldn't watch after luns.